Description: Time Saver addition to every masonry crew. Heavy duty construction with continous weld at all joints. 28" wide x 53" long. Steel disc wheels with pneumatic tires and roller bearings. Easily adjustable wheel spacing and axle position. Three model choices. All include two 8" brick and two 15" block forks. 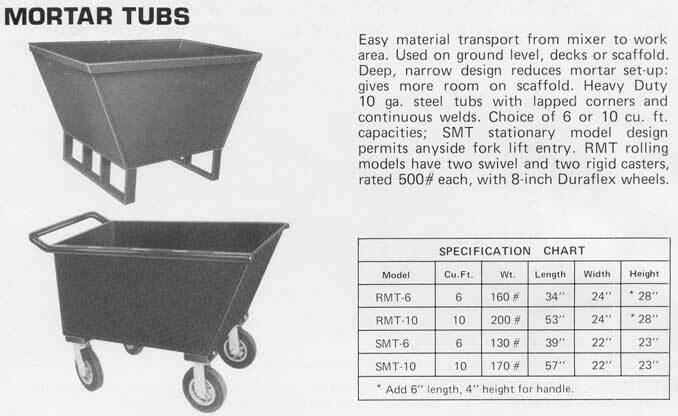 Description: Heavy Duty Georgia Buggies feature reinforced rockers; handle running along and welded to tub sides; special axle assembly with undertub reinforcement bar. Choice of all steel or pneumatic tired, roller bearing wheels. Model 672N fits through standard door frames.